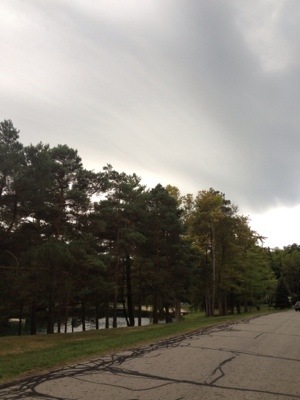 Just before 2.5 miles in I turn west and truly was a little frightened at the sky in front of me. I decided to turn back at 2.6 miles in and figured it would be a 6 mile run. I headed down a different side street that is a cul-de-sac and on my way back the clouds were more overhead than to the west. Keeping an “easy pace” when purple rain is threatening is not so easy. 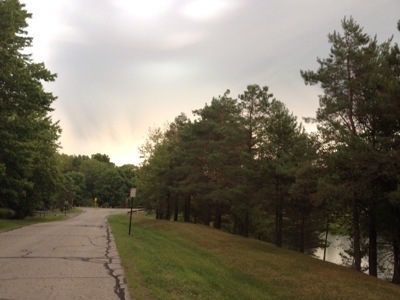 I wanted to finish up the run at lightening pace – before the lightening found me. Determination also played a role and I was not running less than 5 miles. And that is what I did. I ended up running five miles, an average heart rate of 124 and an average pace of 12:52. This is significant – since I started running in my lower zone ranges today was the first time I averaged below 125, and under 13 minute pace. I am getting faster at running slower! Sounds a little silly, but it is something to celebrate. This evening I am lifting and then meeting a friend for dinner, so I am posting a little earlier than usual. The events today are reminders that life requires flexibility if I truly want to seize the day. My body is adapting well to my training and I really wanted to run 7 miles this morning. The storm wanted to race me and if I was going to win I had to make a few adjustments. Spending quality time with a dear friend later on today is truly making the most of my time – not just writing about it. As a planner, I rarely have blank space on my schedule, but how I fill that space will determine if I truly am living it right. Making a few adjustments may be all it takes to seize the day. Have a two year old and 2 month old I’m trying to keep up with. Have been an avid rec hockey and baseball player. With the kids around I’ve gotten into biking. A great break from my regular routine. Yes, cycling is a great sport! Thanks for commenting.